New technology useful in synthesis or sugars, polyalcohols, nucleic acids and more. Applicable in the field of medical diagnostics, biology and biotechnology. The invention relates to a novel method of simultaneously protecting two functions which are same or different, namely hydroxyl, amine, or thiol ones. The method of protecting hydroxyl and amine functions is of great significance to organic synthesis. Protecting hydroxyl and amine functions is especially useful in the chemical synthesis of sugars, polyalcohols, nucleosides, nucleotides, nucleic acids, which constitute a subject of extensive research and development activities on account of their application potential for medical diagnostics as well as for biology and biotechnology research. It is the major application area of the method of protecting a hydroxyl or amine function, and of using novel compound for implementing this method that relates to the chemical synthesis of ribonucleic acid fragments (RNA), where structural units require simultaneous protection of positions 5' and 3' for a protecting group to be introduced selectively into position 2'. Poznan Science and Technology Park is looking for business partners interested in licensing or purchase of the quoted patent. We are interested in any kind of partnership. Our invention has not been previously marketed, It is open for an exclusive license. It provides a solution corresponding to curent biotechnology needs. Therefore it has a great market potential. The estimated value of the invention is USD 180,000. 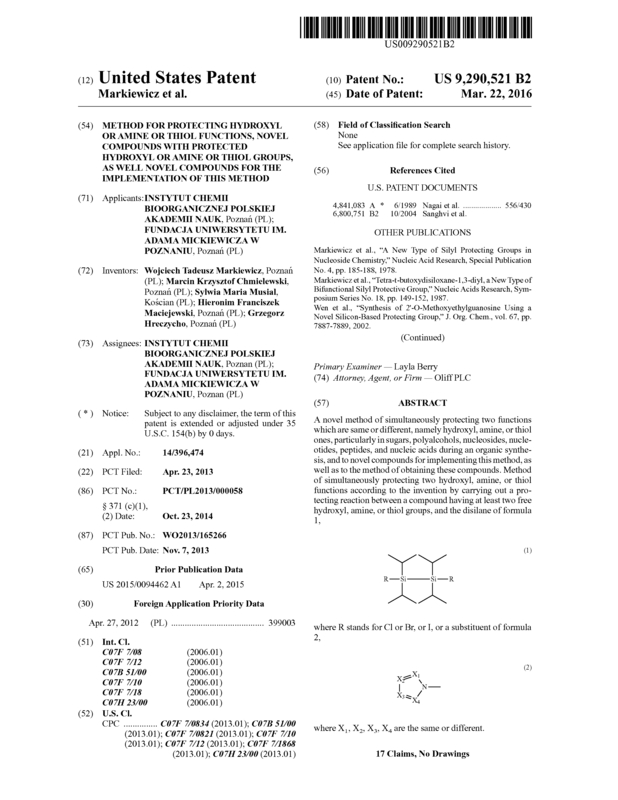 Page created at 2019-04-25 4:02:12, Patent Auction Time.